Your muscles store a limited amount of energy that keeps you working hard for around 90 minutes. Therefore, when training runs are longer than 90 minutes, you need to think about planning your nutrition and fluid intake. Carbohydrate is your muscles preferred energy source. It is therefore vital that a large part of your diet involves carbohydrates. This doesn’t mean you have a free license to eat as much chocolate, cakes, crisps and pizza as you like, but it does mean you can afford to eat more than your average sedentary person! Drink 200-500ml in the 2 hours before training. This will give you just enough time for you to get rid of any excess fluid your body doesn’t need. Eat a carbohydrate snack to top up your energy levels. Sports bars, fruit, cereal bars, yoghurts, fruit bread and cereal are good options. During longer runs (>90 minutes) top up energy levels with sports bars, gels, bananas, nuts or carbohydrate-based sports drinks, for example. You can only digest a small amount of carbohydrate (30-60g per hour) when you exercise. There is no benefit from ingesting more than this, as it will only result in stomach problems. You can choose to eat solid foods to refuel during exercise, but typically this will slow down the rate at which you absorb the energy. Drink 125-150ml (of water of sports drink) every 15-20 min during training. Be aware that the weather, your training intensity, and the clothing you’re wearing will all influence how much you need to drink during your run. Replace electrolytes lost in sweat by adding a pinch of salt to your drink, using a commercial sports drink, using dissolvable electrolyte tablets, or by simply using salt capsules. This will help you retain the fluids you’re drinking and reduce the risk of hyponatremia and muscle cramps. You can read more about this at the end of the article. Refuel by eating a high carb meal or snack within a 60 min window of finishing so that the energy is quickly absorbed and taken directly to your muscles. Rehydrate by drinking around 500ml after exercise, depending on your sweat loss during exercise. Monitoring your urine colour in the hours after your run can help you work out if you are fully rehydrated. If your urine is dark in colour you are dehydrated. Aim for a light straw colour! Protein is just as important as carbs. It will help repair damaged muscles and boost your recovery in time for your next run. Use your palm to work out a portion of protein. A handful of nuts, a palm size piece of chicken, cheese or fish are all good options. Although it can be daunting, race-day can run smoothly if you put together a well-rehearsed nutrition strategy. As ever, there are some key areas that can make a big difference. ‘Hitting the wall’ is undoubtedly a very unpleasant feeling and every distance runner’s nightmare. This point is described as the stage in a race when your glycogen stores start to run low and you feel heavy legged, dizzy and exhausted, resulting in a dramatic reduction in running speed. There is some good news though, as recent research suggests that running speed declines gradually throughout a long distance race, and there isn’t actually a mythical point at which it suddenly declines! Here, we will provide you with a very simple, tried and tested strategy that will help you last the distance and hopefully prevent you from hitting the dreaded ‘wall’. During the 48-72 hours before the race, increase the amount of carbohydrate in your diet (8 – 10 g carbohydrate per kg body weight) while at the same time reducing the amount of protein and fat. At this stage, your training schedule will be quite light so your energy expenditure will be reduced. Therefore, your total calorie intake should be similar, but the percentage which comes from carbohydrates should be higher. Don’t worry about the numbers! There aren’t many of us that have the time to calculate our carbohydrate intake, but there are some really easy practical ways to achieve the desired effect. For example, if you eat a bowl of cereal for breakfast, add some jam on toast and a glass of fruit juice. If you usually eat a ham sandwich at lunch, change it to a jam or honey sandwich on thick sliced bread. If you’re eating chilli con carne in the evening, take one less spoonful of chilli and add another spoonful of rice or half a jacket potato. Warning: For every 1 g of carbohydrate, you store an extra 3 g of water. This means you may end up putting on a little weight (~1 kg). Don’t worry, this isn’t fat, it’s simply the extra energy and fluid you will rely on come race day. There is no doubt you will be feeling nervous when you wake up on race day. Getting your nutrition right can make the difference between running out of steam with 5 miles to go, and crossing the line with an incredible sense of achievement. Below is your step-by-step guide to race day nutrition. Remember – practice this at least once on a day you have a long training run, to ensure you are familiar with it. You need to establish the optimal time for you to eat breakfast before the start of the race. Ideally, you should be aiming to eat 2-3 hours before the start. This will very much depend on how well you tolerate eating before exercise and the logistics of eating a meal if you have to travel to the race. Think about where you will be staying the night before the race and what foods will be available. You may have to take food with you if the hotel does not serve breakfast before 7am, for example. Breakfast is the most important meal you will eat on race day. Eat too little and you could be in trouble at the half way stage. Eat too much and you could be bent double with stomach cramps before you even start. Eat the wrong thing and you could join many other runners queuing for the toilet as the ‘runner’s trots’ take over! To top up your stored energy, you need to have a small snack containing 40 – 60 g of carbohydrate 30 – 60 minutes before the start of your race. When you are planning this snack, you need to consider where you’ll be at this time point. You may already be gathering at the starting point or travelling to the race venue. These factors are likely to restrict your snack options. There is a limit to the amount of energy your body can store and it’s not quite enough to keep you running at a steady pace for the entire distance. Therefore, it’s vital that you ingest some carbohydrate during the race. It doesn’t matter whether this is in the form of a drink, gel, bar or other form, but the quantity and timing is essential. 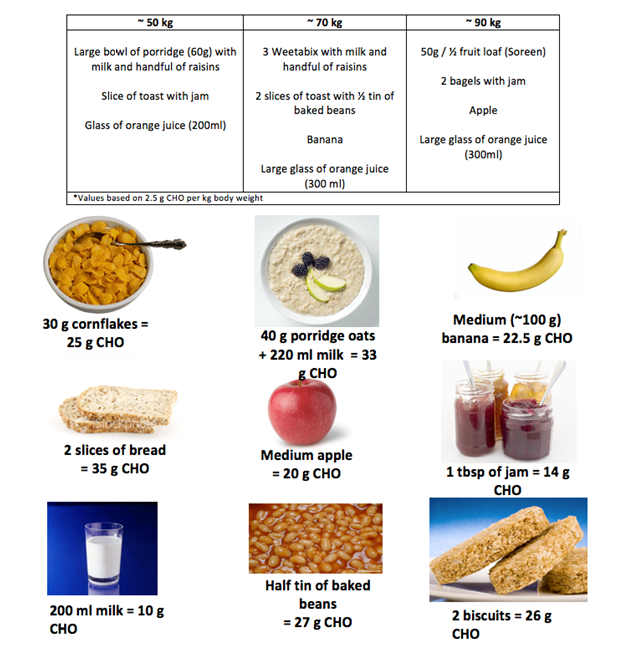 Aim to ingest 30 – 60 g carbohydrate per hour. You need to have an idea of your expected finishing time so you can plan when to ingest your carbohydrate. Check out what products are available on the course and how frequently they are stationed around the course. Make sure you are familiar with your race strategy and have tried it out in training before race day. You may find it easier to write on your hand at which mile or time point you need to eat or drink. Planning ahead is vital. It’s very easy to forget to eat or drink until your legs start feeling heavy and you can no longer maintain your pace. Many runners then try and overcompensate by eating or drinking too much. By this point, it’s too late! In addition to topping up your energy levels it’s also very important you avoid becoming thirsty. Dehydration can cause headaches, stomach pains and perhaps most importantly, make running feel much harder than it normally does. Dehydration has just as much of an effect on your mood as it does your physical performance. As a basic rule of thumb, drink according to thirst, but add a level of prudency on top to ensure you don’t go too long without drinking, particularly on hot days. A lot of runners need to practice drinking whilst running during training, to make sure they are comfortable doing it during a race. It’s also a little awkward carrying a full water bottle or water bladder during a race, so make sure you’ve tried it out in training before the big day. 1. Find out where the aid stations are on the course and what sports nutrition products will be available to you. 2. Tackle the issue of building your race day strategy by breaking the race down into 1-hour blocks. Every hour, consume 30 – 60 g of carbohydrate and drink 300 – 500 ml of fluid. For example, drink 330 ml sports drink and / or a gel every hour whilst sipping water little and often. 3. Try out different products (e.g. gels, drinks, bars, sweets) to find out which work best for you. 4. Practice, practice, practice. Use a long training run or a test event to practice carrying fluid and eating during the run. When you sweat, you don’t just lose water but also key electrolytes such as sodium (or salt). Excessive salt loss may contribute to cramping and fatigue, whilst an imbalance may also cause hyponatremia, a condition which can be dangerous to health, let alone performance. It is therefore important to take a pragmatic approach – it is intuitive that you try to replace what you lose, particularly over long distances. If, as part of your nutrition strategy, you eat savoury food, this will add salt into your strategy – this is generally a good tip for ultra-endurance events. Things like sandwiches and pretzels are very good choices. If you stick to conventional sports nutrition products, then it would be relevant to use a high electrolyte drink and/or electrolyte tablets (such as Nuun or High 5 Zero), or salt tablets. This will replace a greater amount of the salt lost in sweat, preventing muscle cramps and fatigue.